Bayview showing Bajan Pride on de road! On Sunday 13th November the Bayview family was again on the road, walking in the highly-anticipated Nation Funathlon to celebrate the island’s 50th Anniversary of Independence. 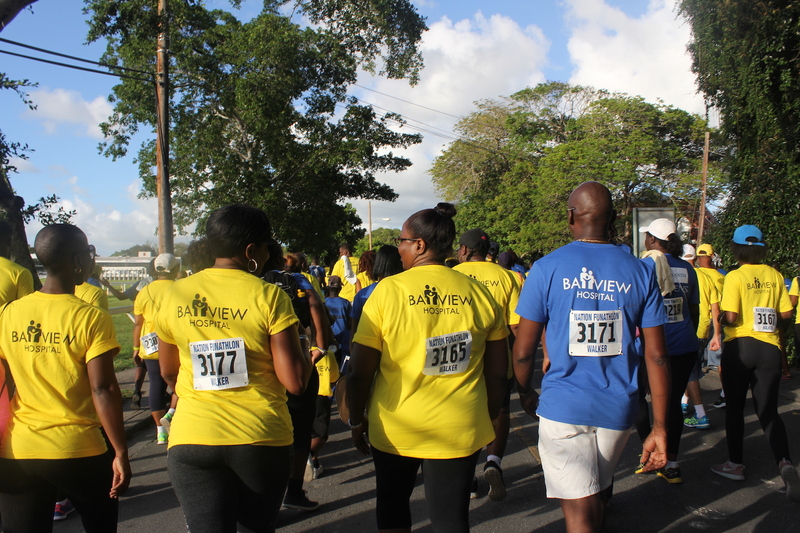 Walking under the theme of ‘Bajan Tuh De Bone: 50 & Proud’, Bayview staff came out in full force to support our nation’s historic milestone, and to help raise money for local organisations and charities who support victims of violence. Setting off at 4pm from the historic Garrison Savannah, the Bayview team walked their way all through town to finish at Queen’s Park as part of the annual 5km walk. It was an afternoon full of Bajan pride and good spirits as our staff rose to the occasion to answer the nation-wide call out to end all forms of violence including bullying, child abuse, domestic abuse, and gun violence. Claire Taylor, Bayview Accounts Receivable Officer, said she was enjoying the exercise with her colleagues and was glad to be part of the thousands of people who turned out to mark our ‘Golden Jubilee’ year, and support the movement to stamp out violence in Barbados. “I decided to do the walk with Bayview because we are THE Bayview family! We all work well together so it’s nice for the team to unite for a good cause and to say Happy Independence to our country,” she said. The Bayview family finished the walk with some light refreshments and musical entertainment to cap off a successful day of team-building. The Nation Funathlon is an annual event that caters to people of all ages and encourages healthy activity in a fun and family-friendly environment, while also raising money for local charities. This year’s event was especially significant as our island commemorates 50 Years of Independence as a nation. Thank you to all staff who participated. Until next year!